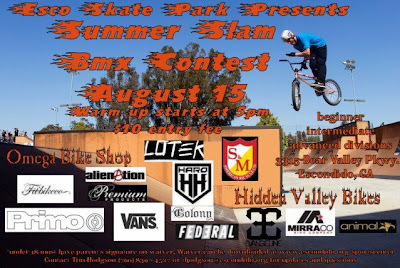 Esco Skate Park Presents SUMMER SLAM ~ BMX CONTENT. August 15th, 2009! Warm Ups Start @ 5 PM. Beginners, Intermediate, and Advance Divisions are all welcom. For Information, Contact Tim Hodgson at (760) 839-0527 for updates and questions!